The last words of an unarmed black man have become the rallying cry for people across the nation who are taking to the streets to protest the vast injustices of an unequal American society. Following Wednesday's announcement that NYPD Officer Daniel Pantaleo was not indicted for the death of Eric Garner, even after video evidence showed the white policeman placing the unarmed, black 43-year-old in a deadly (and illegal) chokehold, Americans across the country are gearing up for yet another night of Eric Garner protests. It may be the second day of demonstrations in response to Garner's decision, but in light of the identical outcome of last week's Darren Wilson ruling, these protests are becoming an all too familiar pattern for many activists who are determined to see change. Or at the very least, to prove that black lives do, indeed, matter. On Wednesday evening, immediately following the shocking announcement, largely peaceful protests erupted across New York City, with crowds gathering at Times Square, Columbus Circle, Rockefeller Center, and blocking traffic at the Brooklyn Bridge and the Lincoln Tunnel. Those at Grand Central Terminal also staged a die-in during rush hour at the busy transportation hub. And on Thursday evening, the gathering scene maintains this same dedication to justice. According to NBC News reports, thousands of protestors marched across the Brooklyn Bridge in a demonstration, and traffic was stopped in both directions on the West Side Highway, where more protestors are gathering. Thousands of New Yorkers are also congregating in Foley Square, which is close to NYPD headquarters and City Hall, many shouting "Hands up, don't shoot," and "black lives matter." The protests are not only happening in New York City. The outrage has spread to all corners of the United States, and in the nation's capitol, hundreds of staged die-ins, presenting a stark contrast to the Christmas Tree lighting ceremony also taking place. Almost as if in response to Fox News' Gretchen Carlson's worst fears, many protestors are planning their demonstrators to coincide with these lighting ceremonies. 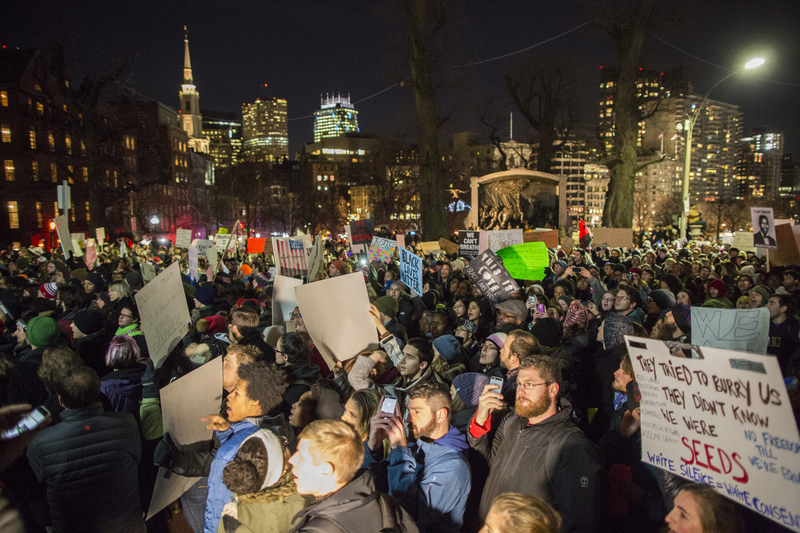 In Boston, some 4,000 people have staged a protest on Boston Common. The scene in Chicago is similar, with protestors disrupting traffic in the city. Across the country, Americans are waking up and joining forces. Perhaps this time, we'll finally be heard.